No matter what your politics, it’s impossible not to be charmed by some of the items in The Private Collection of President and Mrs. Ronald Reagan being sold at Christie’s on September 21 and 22, 2016. A flip through the auction catalogue of over 700 lots shows Tony Lama cowboy boots with the presidential seal, linen cocktail napkins embroidered “Reagan’s Bar” from the couple’s California home and doodle portraits by the former president. The Reagan’s glamorous yet relaxed home life, even at the White House, is captured in a priceless photo of the President and First Lady seated in Billy Haines armchairs (offered at the auction) in front of TV trays in the private residence. Of course, there are a lot of stately items in the collection including Nancy Reagan’s jewelry. 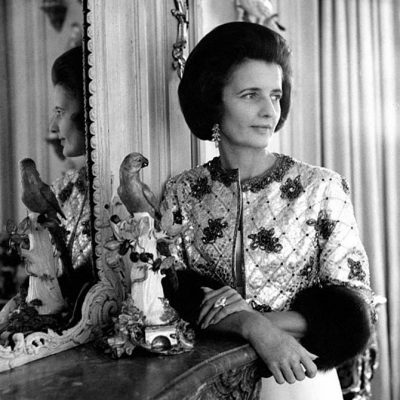 While the former First Lady may have been known for her flawless fashions her well edited jewelry box included some iconic designs. Among the 83 pieces offered during the live sale and an online only portion of the auction running from September 19th to the 28th, there are many of the most well-known names in jewelry including Tiffany, David Webb, Bulgari and Van Cleef & Arpels. The boldest statement piece and the top lot of the sale is a Van Cleef & Arpels gold lion necklace. While there is no date listed in the Christie’s catalogue, it was surely created during the 1970s when the French jeweler made a series of lion pieces. By comparison, Elizabeth Taylor’s Van Cleef lion jewel, the diamond and gold Barquerolles choker, was made around 1971. Mrs. Reagan’s necklace was probably purchased at Van Cleef & Arpels in Beverly Hills on Rodeo Drive during the period when Ronald Reagan was the Governor of California. Photographs of Mrs. Reagan on the campaign trail in 1980 show her wearing the detachable lion pendant as a brooch with matching ear clips by Van Cleef & Arpels also included in the sale. 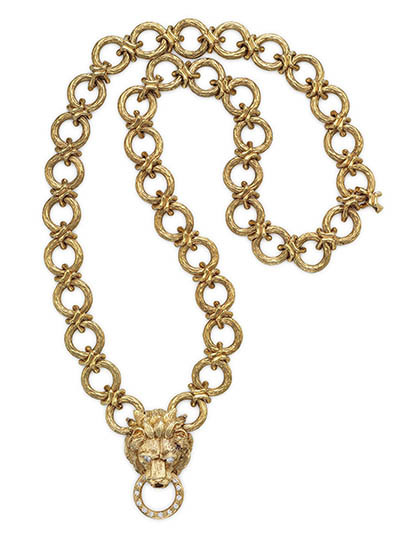 The lion necklace features sculptured gold links. Diamonds accent the ring in the lion’s mouth and his eyes. A convertible jewel, not only can the lion pendant be removed and worn as a brooch, but the necklace can also be divided into parts to wear as shorter necklaces or bracelets. 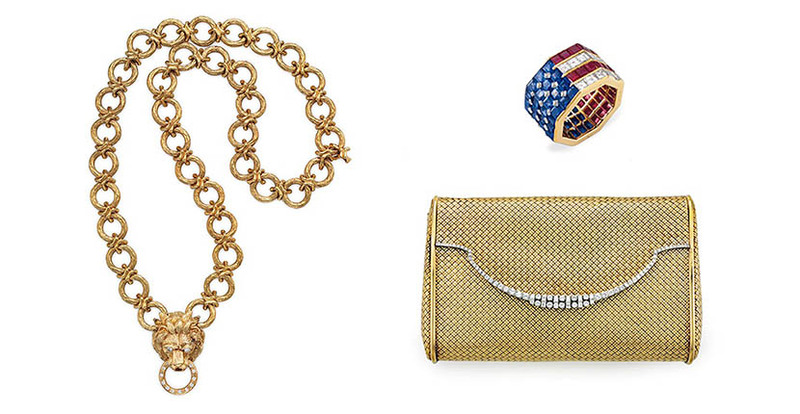 One of Mrs. Reagan’s most glamorous evening jewels is actually an accessory. Her gold and diamond clutch from the mid-century period is not signed but the design is reminiscent of the Van Cleef & Arpels minaudière Jackie Kennedy carried at state dinners during her years as First Lady. Mrs. Reagan’s clutch measures 6 x 4 x 2 inches. 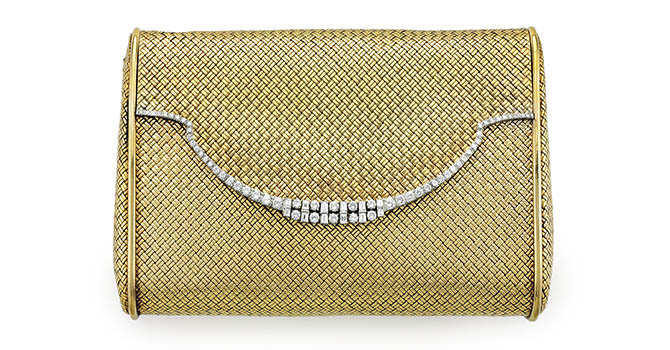 The 18K gold basketweave design is accented with various diamond shapes along the opening and push-piece. A beautiful band ring by Bulgari depicting Old Glory in rubies, diamonds and sapphires proves yet again that Italians made the best patriotic American jewels. The experts at Christie’s are unsure exactly when the First Lady acquired the ring. They feel it was most likely a special commission made in the 1980s. 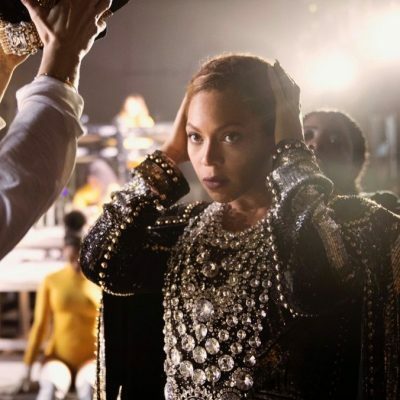 In other words, it was not part of the original Stars and Stripes collection Bulgari launched in the early 1970s that appeared on Cher in Richard Avedon photographs of the period and more recently on Katy Perry when she performed at the Democratic National Convention. The sheer quantity of precious gems in the octagonally shaped jewel make it stand out as different from the earlier pieces that were usually rendered with a significant amount of enamel or coral and lapis. 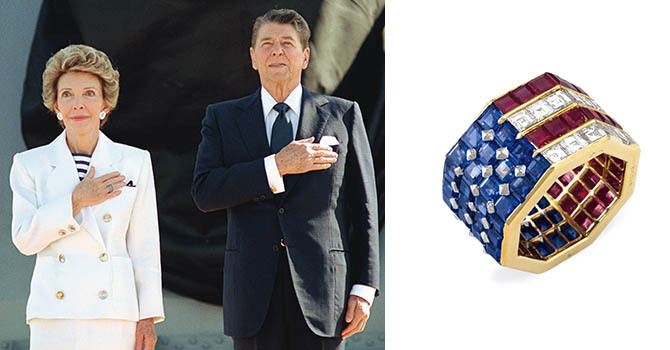 The Bulgari ring can be clearly seen on Mrs. Reagan’s hand in a photograph taken on July 4, 1986 when she was standing for the National Anthem on the USS Iowa in New York Harbor. The exhibition of The Private Collection of President and Mrs. Ronald Reagan is on display at Christie’s in New York from September 17 – 20, 2016. Proceeds from the sale will benefit the Ronald Reagan Presidential Foundation and Institute.